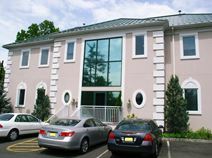 Office Space - Mountainside, New Jersey. Offices for lease with easy transportation nearby. Convenient to downtown amenities and exclusive shopping stores, and restaurants. The offices are new and offer great views from balcony included suites. The latest network access available. Enjoy daily continental breakfast with Starbucks coffee and a Gym & Garden patio. The Video Conference System is via IP. Free 6 hours boardroom use monthly. Owner operated.